When ELP (Powell instead of Palmer) released Touch & Go, my local radio station went ELP crazy. And who wouldn’t? The song is so bombastic it was well suited to 80’s radio. 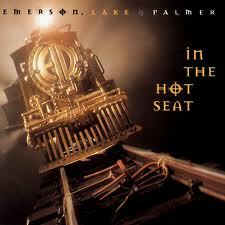 I guess if Yes could hit with Owner Of Lonely Heart then ELP had to have an answer and Touch & Go was a pretty good one. The radio station put older ELP songs like Lucky Man into rotation and then played a concert one evening. I loved it and still would like to own that show if it exists on record. This was my intro to Prog Rock and it’s excesses. While I am not a Prog nut I still listen to it from time to time and admire it for what it is. Like Yes’s big hit, I don’t own the Emerson Lake & Powell record. I have the first record which is really good. Lucky Man is just a superb song and the rest of the record is the equal of Yes’ Close To The Edge album. Tarkus has its moments but sadly Pictures and Works just don’t really feel like they are worth the listening time to me. For some reason I never got Brain Salad Surgery, I know for a long time I would look at it longingly in record stores but but it never followed me home. Maybe because it always cost more than a few dollars. I get pleasure from Black Moon and In The Hot Seat as while they break no new ground, and are obviously older musicians supping on the fat of the land and all that, there are some really great moments that only age and confidence can bring a musician. The re-reworking of Pictures At An Exhibition is well worth it too, Greg Lake is in fine form. I guess I can blame a lot of my love for synth brass on Keith Emerson, after that it may be harder to find their work in mine but ELP were an important step in my musical development.